Continuous flight auger piling is particularly suited for urban areas and on construction sites where it is essential to minimise noise, vibration and disturbance to the surroundings. The CFA system is suitable for the majority of ground conditions in the UK and is an ideal piling solution for new foundations located in close proximity to existing structures. 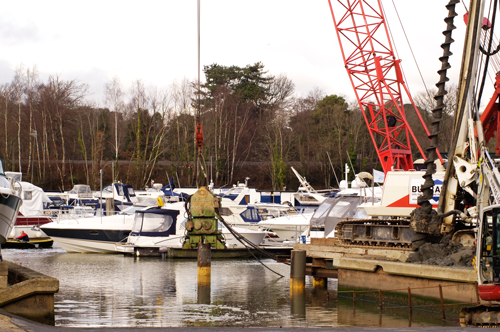 BURRAS Ltd offers a comprehensive service in the provision of augured piling solutions using hydraulically driven mounted or suspended auger systems for piles up to 800mm diameter. See our plant page for all the features of our rigs. For your driven cased and precast piling needs BURRAS Ltd operates a range of specialist hydraulic pile driving hammers including the versatile HY-ram 2750 that attaches to purpose built leaders and is capable of driving piles more effectively than conventional drop hammers. The driven pile foundation solution is suitable for most ground conditions including water bearing sands, silts and the variable soil conditions often encountered on river and estuary site locations. BURRAS Ltd is also particularly experienced in the installation of steel tubular piles using either vibrating hammers or conventional drop hammers. The use of tubular steel piles is particularly suited as a foundation design solution for marine construction projects and is often the method of choice for temporary works platform structures.